ARE LEAH AND JEREMY BACK TOGETHER? Despite all of the chumminess, neither Leah nor Jeremy have confirmed they are back together in any sort of official capacity. WAS LEAH TEXTING JEREMY BEFORE SHE BROKE UP WITH JASON? Normally, a random comment on Facebook wouldn’t merit a mention from us, but Leah took it seriously enough to respond on Twitter before tracking down the original post and responding more at length there. I couldn’t even text Jeremy outside of the group thread with Jason in it. I’m sure it was just the typical conversation for Jason… everyone is to blame and wrong BESIDES himself. Please know that this isn’t accurate AT ALL & he doesn’t want me to even go there. I’ve beeeeeeen trying to be nice but when someone is so desperate for attention they can’t help but play the victim. We’ve been broke up for well over a month now. I’ve always got along with Jeremy and if we want to hang out, we will. I just wanted to set the record straight because it’s so far from the truth. I know it’s not your fault because it’s just what you heard… however it’s unfair for me not to be able to voice the truth trying to play nice. 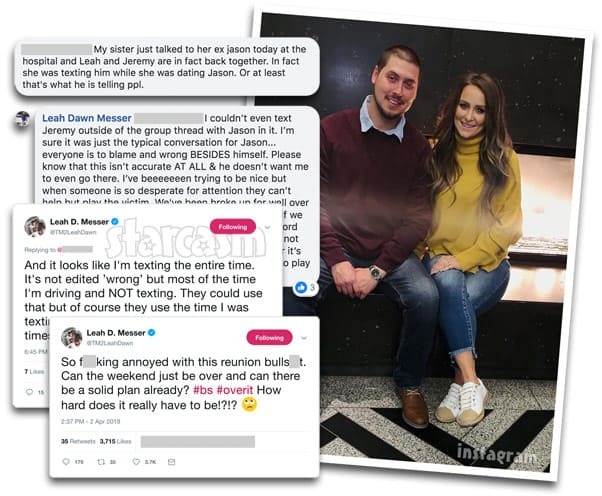 Oh man, it sure sounds like Leah is biting her tongue on what really happened between her and Jason! 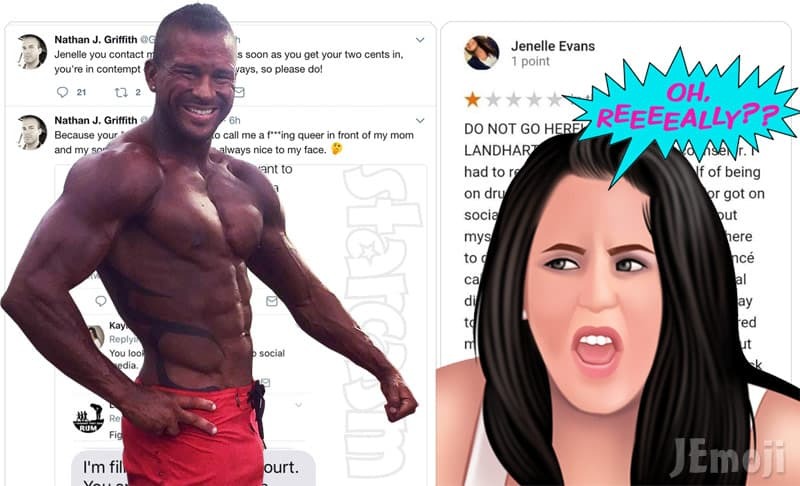 Perhaps we will see a little of that on this season of Teen Mom 2? There are numerous reports from the Teen Mom 2 Reunion filming in New York City over the weekend indicating that it was the most drama-free Reunion in years. Of course, that is in reference to the drama between the cast members. There was still quite a bit of drama, but it was all stemming from the measures producers had to take in order to keep the moms away from each other. TWEET: It must be bad if you’re cussing! LEAH: I’m not complaining… I just want a solid plan and to get it over with. LEAH: Over it sooooo over it!!!!!! TWEET: Why are they asking for special accommodations? Don’t they all travel for other things. But all of a sudden… Sorry they’re making it hard for you. LEAH: I’m just saying if what you wanted has been accommodated just get on with it and if not do whatever you have to do. Have a solid decision! It’s everyone’s schedule being messed with. It’s all crazy 😫😫 nothing is the same anymore and it’s honestly sad. TWEET: Leah, Randy runs a dental practice. This show is literally the only thing you do for money. What do you think about Leah’s new attitude? And what about her new hair? I’m liking both! 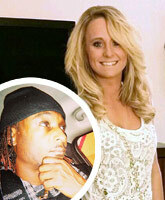 Oh, and I guess the biggest question: Do you think Leah and Jeremy should give their relationship another shot?